“Lawyer month” continues with one of Matt’s first real cases (well, that we’re actually aware of), his defense of Willie Lincoln, a blind former police officer and war veteran who has been falsely accused of taking a bribe on the job. This story happens in issue #47 and Wille would go on to make a handful of later appearances. What is interesting about issue #47 is that it actually tries to deal with some real-world issues and be something more than just your average slug fest. Introducing a blinded Vietnam War veteran could have been completely hit or miss, but this is one issue that, while not exactly fine literature, actually works on a number of levels. The issue was very well received by the fans at the time, and the war was a very hot topic (I belive this issue came out in 1968). Of note, though we may not think about it now, was the fact that Willie is African-American, and many of the fans whose letters were published in later issues congratulated Marvel for being ahead of its time when it came to issues of race. The story begins in Vietnam, where Daredevil has gone to entertain the troops (the only real major lapse in logic in this issue). 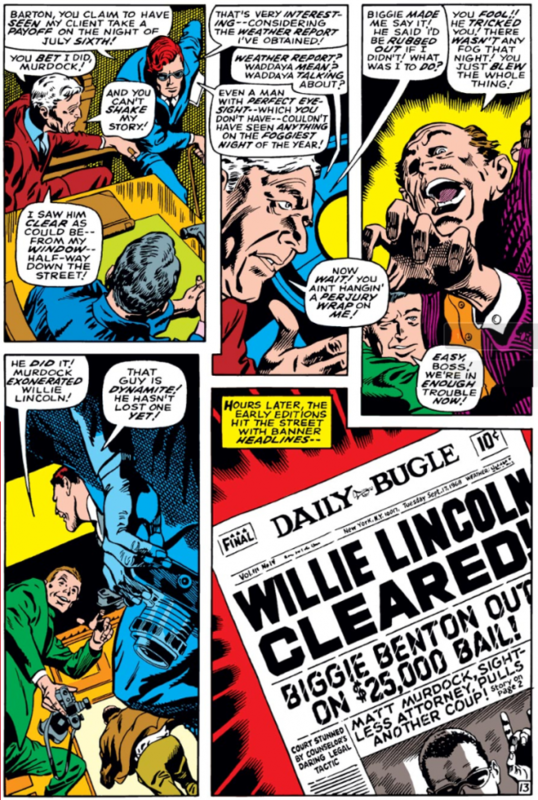 Among the soldiers in the audience is Willie Lincoln, a big Daredevil fan, who has lost most of his sight to a grenade. In the middle of Daredevil’s performance, he goes completely blind and is taken to the infirmery where he gets a visit from DD to boost his spirits. 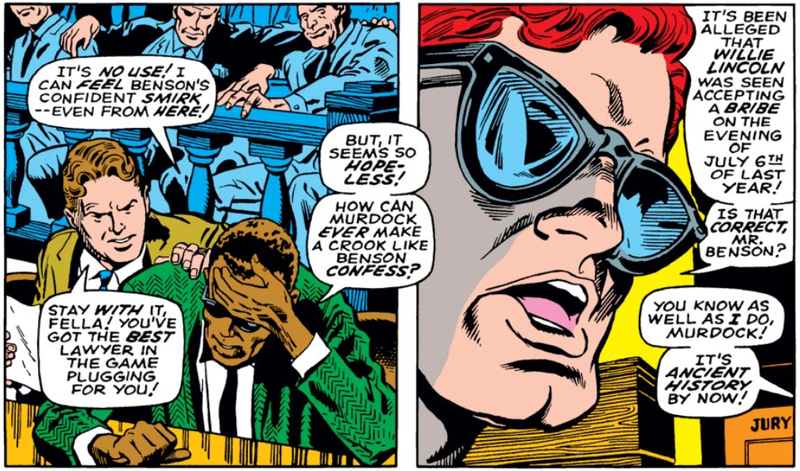 DD tells Willie to seek out Matt Murdock, a “friend of his,” upon return to New York. Back on his native soil, Willie starts rebuilding his life. There is, however, one problem from his past that still haunts him, and he needs to find a lawyer to help defend him against the false bribery charges against him. He comes into contact with Karen Page, who now works at the welfare department, and she advices him to seek out Matt, a name Willie vaguely remembers. With the false witness fearing he’ll get charged with perjury, he confesses that Wille was set up. Biggie loses it big, there wasn’t any fog that day, it was all just a clever move by Mr. Murdock. Nice going there, Matt! And, according to the reporters outside, he hasn’t lost a case yet. Well, considering this is one of the few cases we’ve seen him try, that might explain his perfect record. So what happened to Willie? Well, the bad guys decide to go after him again, Daredevil saves the day and Matt and Willie become friends. Willie goes back to working for the police department, and finds that he is not without hope for the future. Nice, and uplifting story without being too cute.